Red, White, and Blue Cherry Cheesecake Macarons are the perfect dessert for a Memorial Day or Fourth of July party! The colors are so fun and festive, and perfectly patriotic. And you’ll love the combination of sweet almond, tangy cream cheese, and fresh summer cherries! Well folks, it’s almost Memorial Day. Can you believe it? This year is just whizzing by, but I’m so glad we’re finally heading into the warmer months. This really is the best time of year! My kids are at an age where they ask a million questions. Recently they’ve been wondering what Memorial Day is all about. It’s something I had never really given much thought to before, I’m ashamed to admit. To me it’s just the unofficial kickoff to summer. But really, if I’m answering their question the right way, it’s a holiday to remember all the brave people who have fought for our freedom. And to feel grateful for the sacrifices they have made. So, I want to acknowledge that and send a huge “thank you,” to all those families who have given of themselves to make sure that I and my kids have a safe place to call home. We will be thinking of you this holiday weekend! Do you have any big plans for Memorial Day weekend? We used to head down the shore but eventually learned the hard way that the weather’s not usually quite right for the beach just yet. So, we’ll be hanging at home. It’s looking like it will be sunny and in the eighties here in the Philly ‘burbs, so we’ll probably enjoy some time in the back yard playing wiffle ball, barbecue-ing, and just relaxing. I’m so looking forward to it! 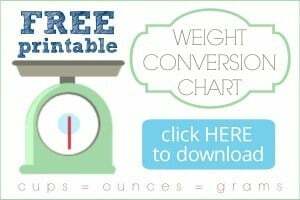 If you’re hosting a party or even just planning to attend one, you’ll get lots of ooh’s and ahh’s when you bring these babies out. The colors alone are so festive and striking, they put you right in the patriotic mood. And the cherry cheesecake filling is just the perfect combination of flavors for this time of year. It all starts with my Basic Macaron recipe. But I’m not going to make you click over for that, I’m including it below. Because it’s a little trickier when you’re tinting the shells two different colors. 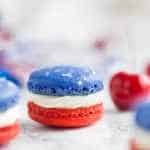 Macarons can be fussy and accurate measuring is a must. And so is folding the almonds into the meringue just so. So there’s a little extra weighing and dividing for these, but hopefully my instructions make it super simple for ya. And I think you’ll find it’s all worthwhile in the end. If you’re at all nervous or just want to learn more, be sure to click over to the original recipe because I’ve got lots of tips and tricks and even a video tutorial. Can I make a confession? 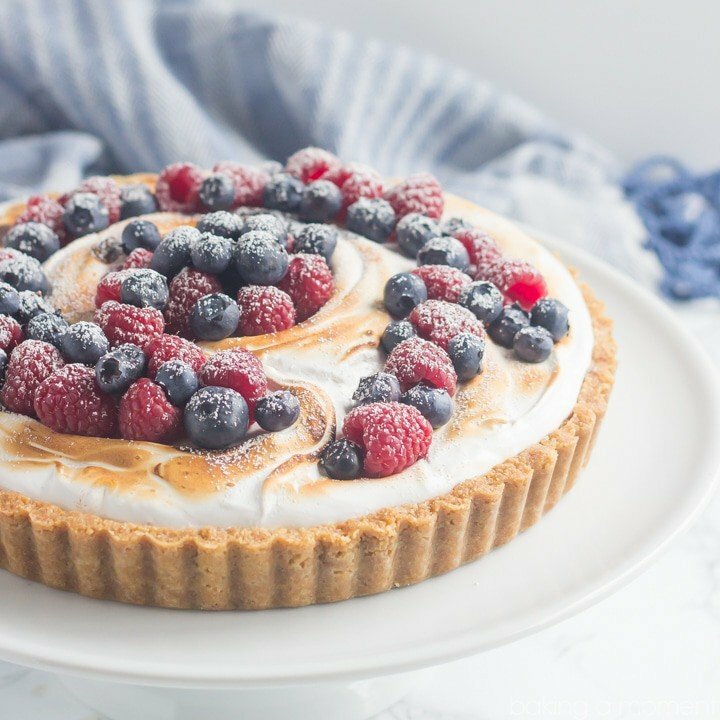 I love red, white, and blue desserts, and I pin a ton at this time of year. But I have a pet peeve and I hope this doesn’t make me sound snobby or nit-picky. The colors are red, white, and blue. NOT red, white, and turquoise! I know a lot of the so-called “royal blue” food colorings aren’t really true blue, but I feel it’s important to get that right. I’ve learned from trial and error that to get a nice deep blue, you need to mix royal blue with violet. And it’s really almost a one-to-one ratio. I know it sounds a little crazy, but trust me! If you really want the colors of the American flag, it’s what works. And don’t forget the edible glitter! Those silver stars complete the whole look. I picked mine up at Michael’s, but I’m including a link so you can buy them online if need be. Have a safe and happy Memorial Day, everyone! 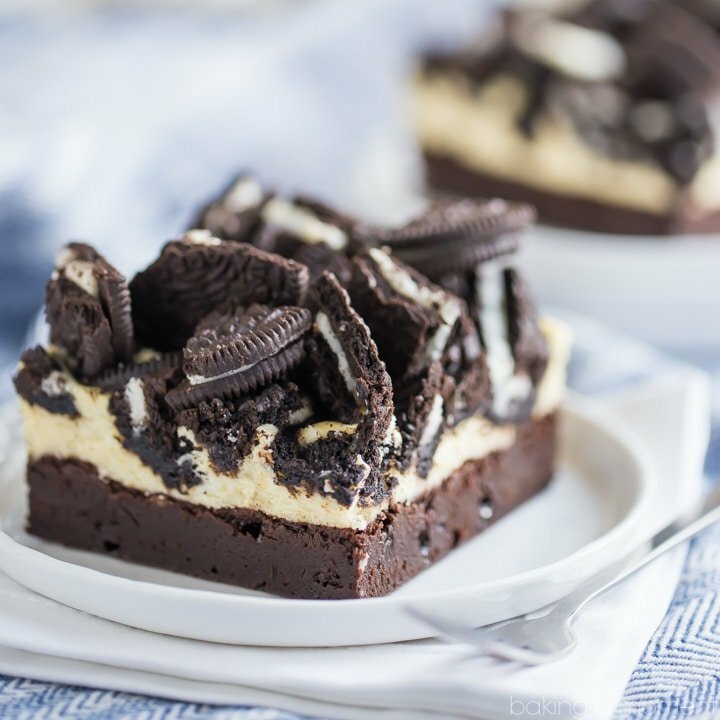 And if you’re looking for more great desserts for your cookout, I’ve got lots more ideas in this category, and a few more specific suggestions below! 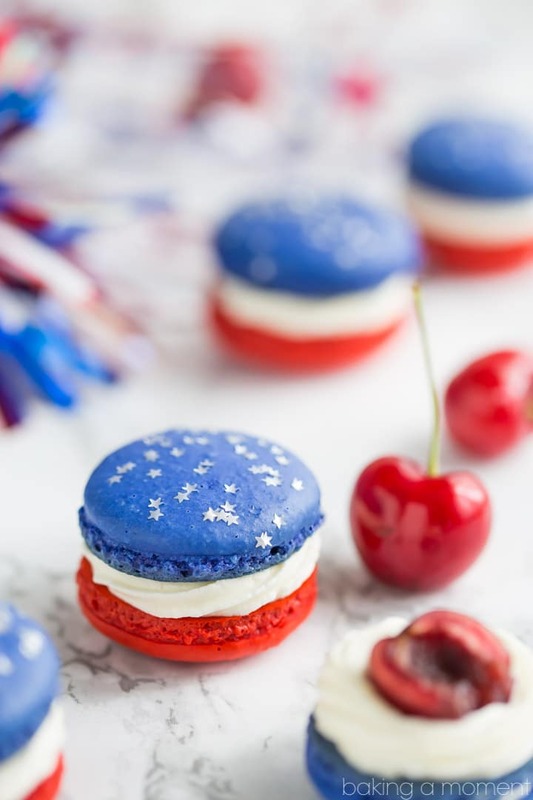 Red, White, and Blue Cherry Cheesecake Macarons are the perfect dessert for a Memorial Day or Fourth of July party! The colors are so fun and festive, and perfectly patriotic. 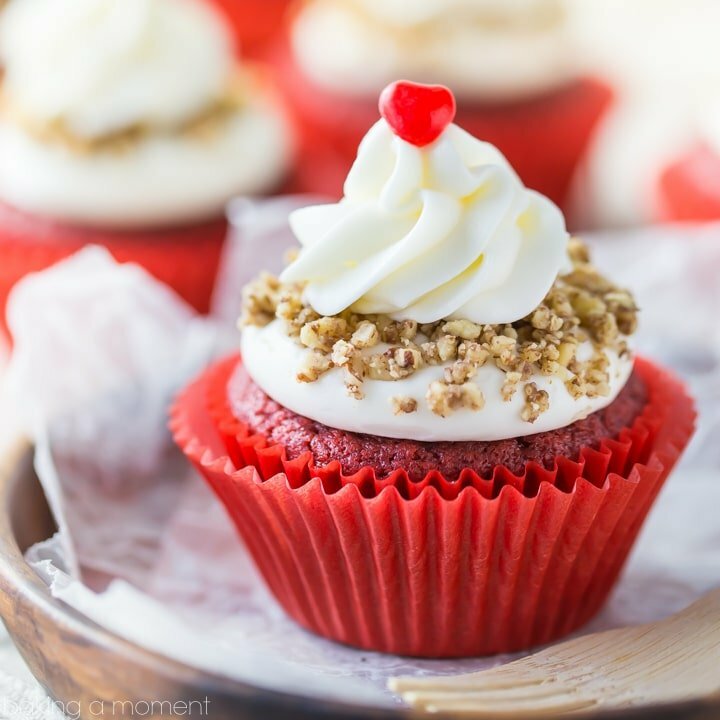 And you'll love the combination of sweet almond, tangy cream cheese, and fresh summer cherries! Set the egg whites aside to come to room temperature. Measure the almond meal, powdered sugar, and salt into the bowl of a food processor. Process the mixture finely, then sift, discarding any large bits. Using a kitchen scale to measure accurately, divide the mixture equally between two small bowls, and set aside. Measure the granulated sugar in a small bowl. Add the cream of tartar to the whites, and mix on medium-high speed, using the whip attachment. When the whites hold soft peaks, start adding the granulated sugar, very slowly, while continuing to whip. When all the granulated sugar has been incorporated, continue to whip until stiff. 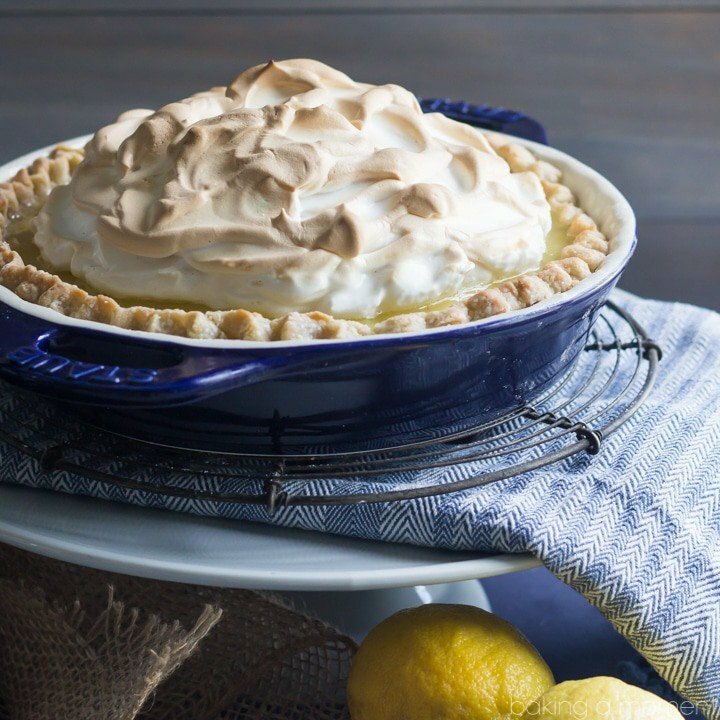 Using a kitchen scale to measure accurately, divide the meringue equally between two medium mixing bowls. Tint one bowl of meringue with red gel paste food coloring, and the other with equal parts royal blue gel paste food coloring and violet gel paste food coloring. Add half the almond meal mixture to the red meringue, and fold together until the batter drops from the spatula in a long ribbon. Transfer to a piping bag fitted with a large round tip, and pipe 1 1/2-inch diameter rounds onto parchment-lined baking sheets. Repeat with the blue meringue. Sprinkle edible star glitter on the tops of the freshly piped blue macarons. Allow to dry for 45-60 minutes, or until thin, dry membrane forms on the surface. Preheat the oven to 300 degrees F, and bake the macarons (one sheet at a time) until set (approximately 10-15 minutes). Do not brown. Allow to cool on the baking sheet, then carefully peel from the parchment and sandwich with filling. Place the cream cheese and butter in a medium mixing bowl and beat together on medium speed until smooth and well incorporated. Stir in the powdered sugar, lemon juice, almond extract, and salt, then increase the speed to medium-high and whip until fluffy. Spoon or pipe about 2 teaspoons of the cream cheese mixture onto half the macaron shells. Press a halved cherry in the center, then top with the remaining shells. Be sure to check out my Basic Macaron recipe for tips, tricks, and all the tools you'll need. YES. JUST YES! Love the little stars, and the bright colors of the macarons. Brilliant, my dear! Yay!! Thank you so much Sarah I’m so happy you like these! Have a great holiday weekend hon! I’ve always been afraid to try to make macarons. Is it hard? This recipes makes me want to try. Lovely! Pinned for later. These are stunning! 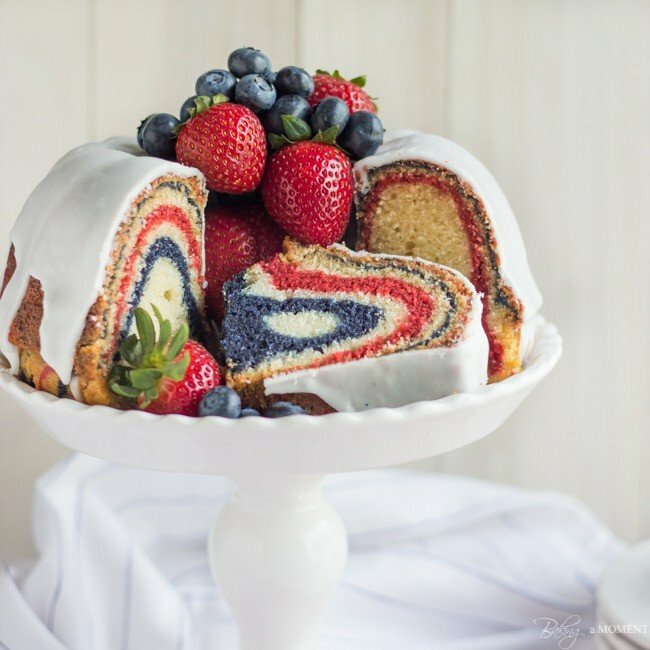 Every picture I kept saying “Wow…” What a perfect dessert for Memorial Day or The 4th! Thank you so much Thalia! Hope you have a great weekend sweetie! 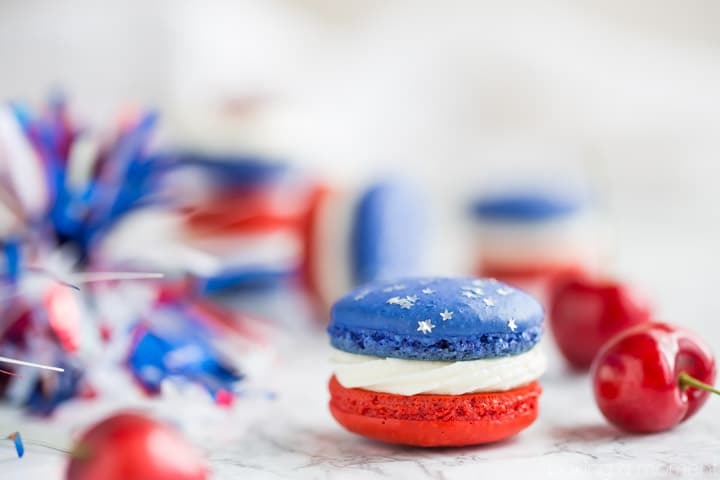 These macarons look gorgeous Allie! Beautiful post, Allie! And these macarons are absolutely stunning!!! Allie, these are stunning and so festive! I love the macarons! Every time I see you make some, I want to make some! these are perfection! You have some beautiful macs on your site too! Thank you so much Alice- hope you have lots of fun this holiday weekend! I absolutely adore these Allie! I mean wow girl! Allie, these are so adorable! I love everything about them, from the star sprinkles to the flavor combo. These are gorgeous!! Love the tip on the color too. Thank you for that! My pleasure, Sara! I just love that deep, true blue 😉 Thanks for the sweet comment! Could I make the shells one day, fill them the next and serve them the day after filling? Hey there Melody! That’s exactly what I would do 😉 Good luck and enjoy! I have always wanted to make macaroons and your post gives me that confidence, Thank You! Piggy backing off the previous comment, if filling the day before a party, do we refrigerate because of the cream cheese? Won’t the shells get soggy if so? Or, do you suggest filling day of party and leaving out at room temp? HELP. Karen from across the bridge in South Jersey ? Such incredible macarons, and surprisingly easy to make! 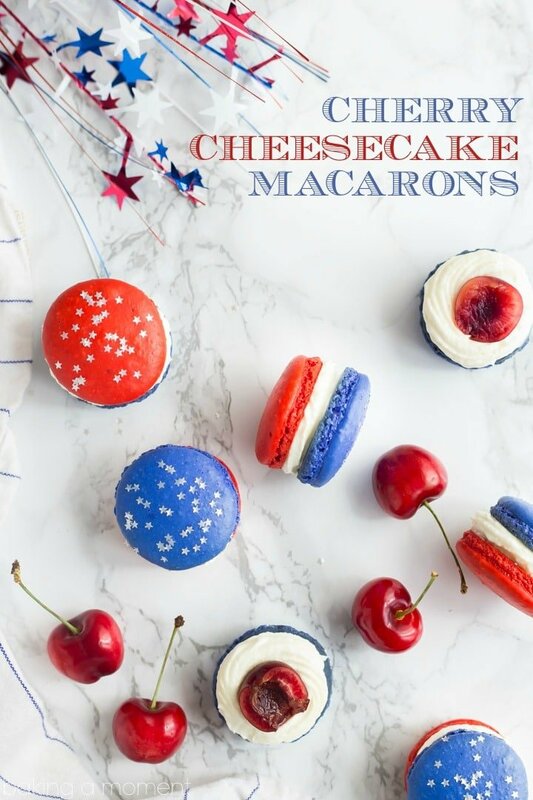 Macarons with cheesecake filling? I’m in!!! These are gorgeous! These are awesome! 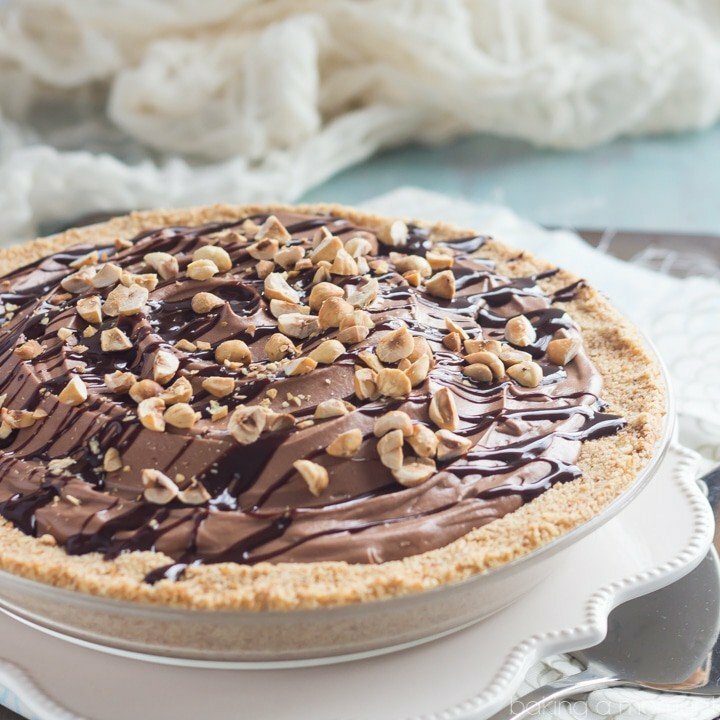 So great for summer celebrations! Would using maraschino cherries effect the taste any you think? Hi Brittany! Maraschino cherries tend to have a much sweeter taste than fresh cherries, but if you like that, then go for it!